The day before The Astronomer and I departed from Saigon for Hanoi, Ba Sau (my grandma’s younger sister) invited us over to her home in Phu Nhuan District for a final feast. 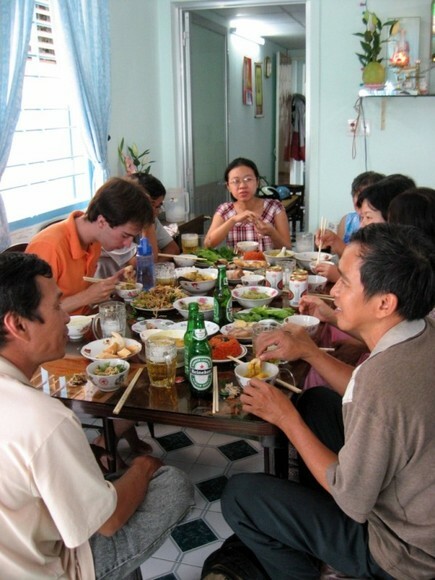 Throughout our year in Vietnam, Ba Sau treated us to fabulous homemade eats, and this last lunch was no exception. Ba Sau and her daughters-in-law worked all morning to prepare this amazing spread. 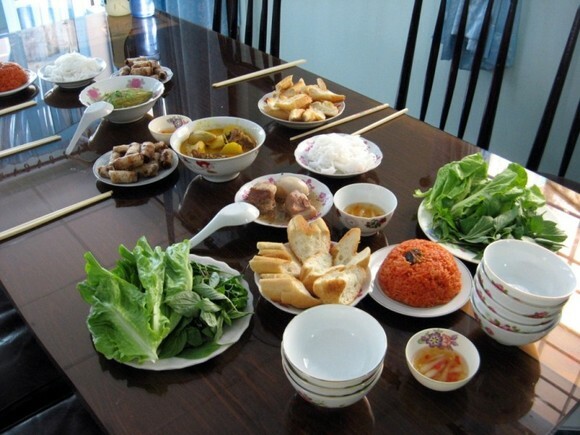 I had some of my best meals in Vietnam at Ba Sau’s lovely home. I fondly remember the time she made a special version of bo bia when my friend Liana came to visit and the time she prepared banh tet from scratch during Tet. Her generosity and mad kitchen skills are unparalleled. 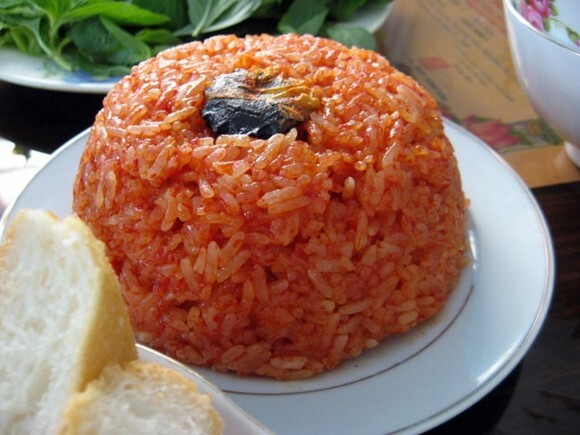 My Uncle Son’s (Son is his name) wife made xoi gac—sticky rice flavored subtly and colored intensely with gac fruit. The prune-looking garnish is actually a gac seed. 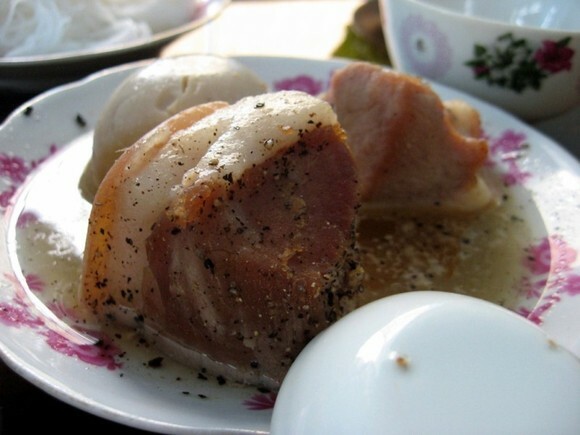 Ba Sau made one of my all-time favorite dishes, thit kho—caramelized hunks of braised pork legs and hardboiled eggs. The layer of fat is pure lusciousness. 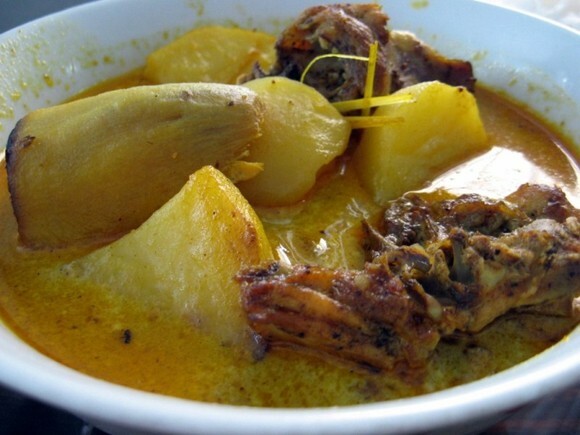 Ba Sau’s ca ri ga—chicken curry—is the stuff dreams are made of. The rich, creamy and slightly spicy broth tastes amazing poured upon vermicelli noodles or dipped with a fresh baguette. 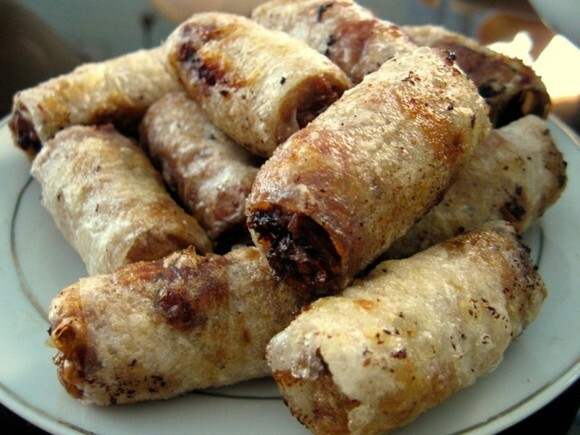 The feast would not be complete without Ba Sau’s signature dish cha gio—Vietnamese egg rolls. Each cha gio is the length of one’s pinky finger and filled with a mixture of ground pork, spices (fish sauce, pepper, etc.) and taro root. The crisp and blistering golden skins are my favorite part. I asked my grandma back in the states why our family doesn’t make cha gio like Ba Sau’s and her reply was that it was just too labor-intensive. 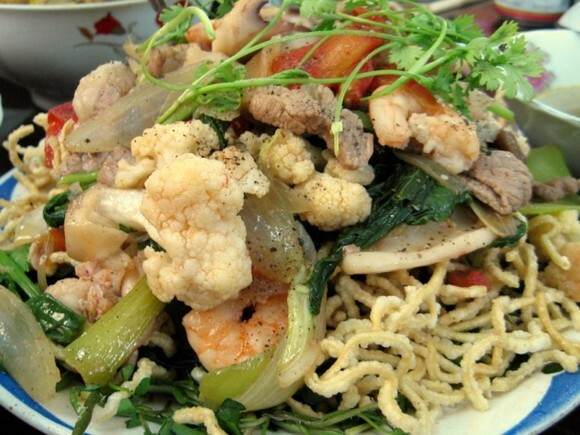 The mi xao gion—crisp noodles topped with a light gravy and chunks of vegetables (cauliflower, bok choy, carrots) and various meats (beef, squid, shrimp)—was also fabulous. My aunts kept on refilling my bowl everytime I finished a serving. I gladly gobbled up everything set before me. 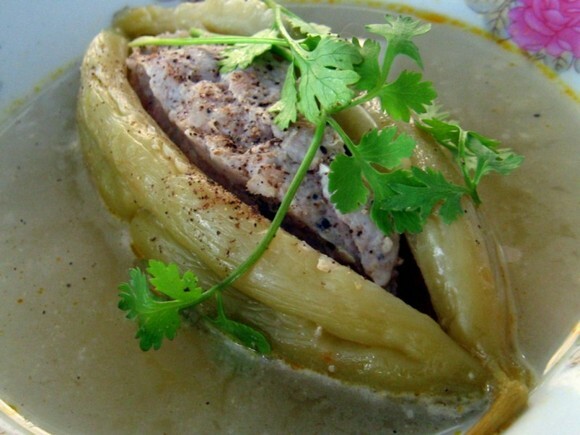 And last, but certainly not least, khổ qua nhoi thit—bitter melon stuffed with pork. True to its name, bitter melon is usually too bitter for my tastes, but Ba Sau’s rendition was surprisingly palatable. I didn’t quite get the exact details about how she extracted the bitter from the melon, but somehow, someway, the melon tasted slightly sweet and just a bit bitter. Ba Sau does wonders in the kitchen. 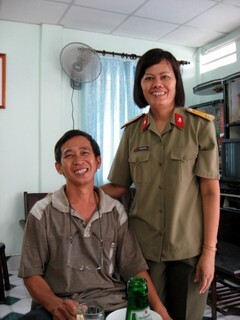 Family—Cau Minh and Son (top), Di Phung and Mo (bottom, left), Cau Son and his wife. We left Saigon with full bellies and huge smiles upon our faces. 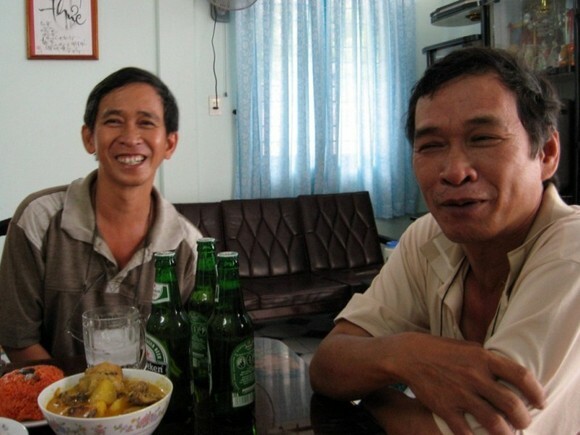 I seriously cannot wait to get back to Saigon—Ba Sau’s hospitality is nothing short of five stars. I love this post! you come from a great line of culinary traditions and i hope you are writing the recipes to keep it going ;). wooooo.. i would do anything to be able to sit and eat on your auntie’s dining table. You are so lucky! Basau resembles of my grandma. Maybe… all southerners’ grandmas just like basau. It might as well basau is my…. Oh well one thing I know for sure I love your basau. My grandma passed away 4 years ago, and she is just like basau.. enjoy her while you still can. Tell basau I love her. What a feast. Thanks for sharing it! A tip on bitter melon – the bitterness does vary from plant to plant, but young and fresh is generally the way to go. They get more bitter as they get older, or with time off the vine. The feast looked excellent but my appetite might have been sapped by the uniform…! Those saliva-inducing pictures are tough to take at lunch time. Is ba Sau looking to adopt a grandchild? I am available. How fun, family and food! Your great-aunt does look like a freakin’ dynamo in the kitchen – that’s some of the most capable home frying I’ve ever seen! My tip for bitter melon – I make this fairly often after growing up eating it almost weekly and as long as you boil the bitter melon for at least 45 minutes in broth it will get sweet. The longer it sits in the broth the sweeter it gets, which means leftovers are the best! My hunny doesn’t like it the first night I make it (because I’m too impatient to simmer it longer!) but he loves it the next night. Mmm… that meals looks like a spread at my parents house and it’s making me hungry! I live in Seattle so this has worked for me here, where the produce probably isn’t the freshest/youngest melon it could be. Sari – Anything?? Just kidding. 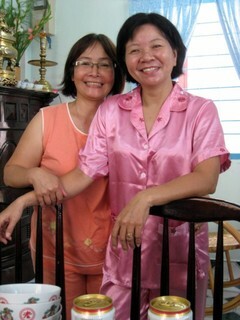 I was extremely lucky to have such generous relatives in Saigon. What I wouldn’t give for another feast! Bern – The next time I get Ba Sau on the phone, I will relay the message. Promise. Tom – Good to know! I’ve never shopped for bitter melons before, but is it pretty clear which ones are old news and which ones are young and hip? Nina – The uniform kind of startled me too! Our mothers trained us well. Ariel – I am so jealous that you ate Sticky Sticky Buns AND doughnuts from the Doughnut Plant!! I look forward to reading more of your East Coast eating adventures. goober – I hate to admit it, but you’re totally right. Something about the goofy grin, right?